Small wonder he spends all his waking hours trying to convince us to stay ! Honestly Realist - we are reliant on imports. We import a lot of components and raw materials which are needed for manufacturing etc. I'm not sure what you are trying to prove but it shows a fundamental ignorance of how the economy works. It's not my chart Annie. Go take it up with FullFact.org if you don't like it. 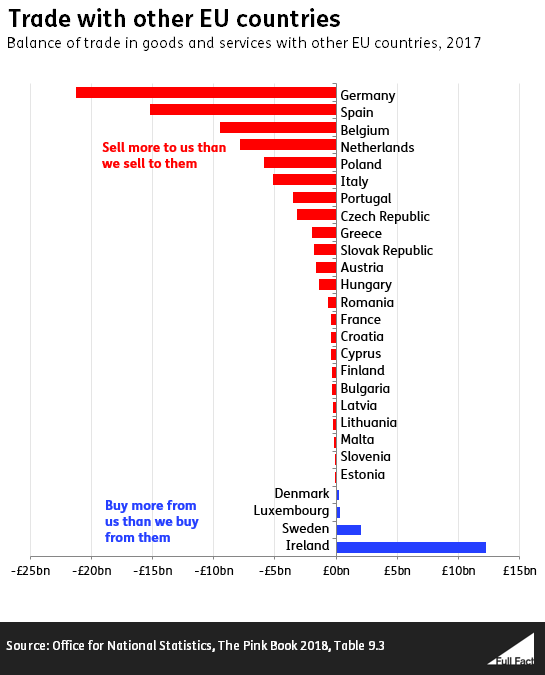 Point is, out of the EU we will be free to import from other countries with our own deals. That would clearly cause significant problems for Germany, Spain, Belgium and Netherlands and the others who clearly rely on the UK massively for their exports. It's your commentary that I was referring to. If we can't import plants from Holland a lot of garden centres are going to struggle.